Jenny: Gitte, my heart hurts and I think I may need a hug after finishing Loving Mr Daniels. This author certainly put us through the emotional mill didn’t she? Such beauty in this authors words. Initially, I felt a bit out of sorts because this book had a very familiar “feel, and it was clear who this authors influences were, but Brittainy C. Cherry soon took this story and made it her own didn’t she Gitte? Her words were tender, sad, and hopeful and my strong connection to her characters and story was cemented through my two main loves – reading and music which were naturally woven through the wonderfully developed characters, beautifully told story and exquisite personal touches. 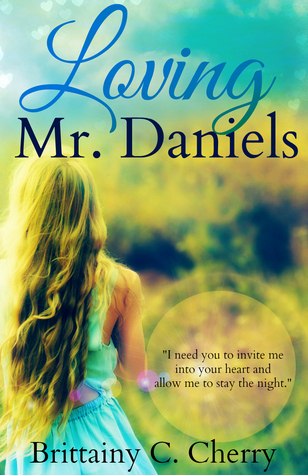 Told through the eyes of the Daniel and Ashlyn, two beautiful souls who have sadly had lived through their share of pain and tragedy, Loving Mr Daniels was a powerful, inspiring and moving story about self-discovery, loss and love. This was such a poignant story that to categorise it as merely a student/teacher book would be simplifying it and doing this story an injustice because it is so much more. This was a truly emotive read that came from the author’s heart and it showed didn’t it Gitte? Gitte: It really did, Jenny. Loving Mr Daniels has all the elements and passions I absolutely love to experience and read when picking up a story. It has pure raw emotion, fantastic evocative story-telling, music and characters that immediately burrow into your heart to take permanent residence. It was quite simply stunning. I do agree, Jenny that at times I briefly paused at the familiarity of moments throughout the story. However, I do believe that this Author did indeed have her own story to tell. Following the journey of Ashlyn and Daniel was complex, so extremely heart-breaking yet hopeful. However, their journey was multiplied by the journey of others interwoven to make it so much more. It’s not often as a reader you come to connect and care so deeply for every single character in a story, but this time is was unavoidable and my emotion was that of an intense roller coaster experience. Brittainy Cherry took my heart in her hand and squeezed it till the pain was unbearable, then every so often she would loosen her hold; I’d take a gasping much needed breath only for her to repeat…repeat…repeat. By the end I was exhausted and running out of tears. Loving Mr. Daniels was incredibly passionate and powerful; a story I will truly never forget. Jenny & Gitte: It wasn’t just the main characters that held it together; the secondary characters, along with Ashlyn and Daniel, each had their own heartbreaking stories to tell. Ryan with his struggle to live his life with honesty and finding acceptance, Hailey with her low self-esteem and eagerness to please. Each was so important and brought a new depth and richness to Ashlyn and Daniel’s story. Loving Mr Daniels was a stunning novel about self-discovery, dealing with grief, knowing that living is the best way we can honour those we lose and that acceptance is the most important thing we can give to someone. We were taken through the complexities of youth, those tentative years when we move from children to adults. When finding that person who reaches into your heart and soul is something to grasp with both hands. So why not 5 stars? Well, it truly was a five star read for us up until a certain point in this story. This Author writes with such emotion and such class and ALL her characters had or were suffering with loss, personal struggles, society’s perceptions and family issues. She made us care so deeply; she made us fall in love. One incident was in our opinion completely unnecessary and seemed to have been added for dramatic effect rather than poignancy to the story. It didn’t need to be taken to the extremity of which it was. We felt as if her character had been let down badly and became an unnecessary exclamation mark to an incredibly sad sentence. Sometimes, less is so much more and this was the case here for us. Overall, Brittainy C Cherry encapsulated everything we look for in a book and this is one we recommend picking up. We URGE you to pick this one up and be amazed! To Whom it May Concern,It was easy to call us forbidden and harder to call us soulmates. Yet I believed we were both. Forbidden soulmates. When I arrived to Edgewood, Wisconsin I didn’t plan to find him. I didn’t plan to stumble into Joe’s bar and have Daniel’s music stir up my emotions. I had no clue that his voice would make my hurts forget their own sorrow. I had no idea that my happiness would remember its own bliss.